In a medium bowl, cream together the margarine and 1 cup white sugar until smooth. Beat in the egg and molasses until well blended. 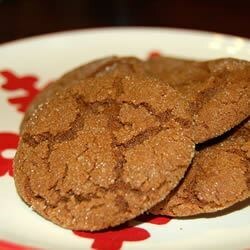 Combine the flour, ginger, cinnamon, baking soda and salt; stir into the molasses mixture to form a dough. Roll dough into 1 inch balls and roll the balls in the remaining sugar. Place cookies 2 inches apart onto ungreased cookie sheets.